Miracle number one – Guns N’ Roses are still together. Miracle number two – they’re a much better band than they were a year ago. Faced with the prickly dilemma of trying to remain outrageous rock’n’roll outlaws when they are adored by a vast 14 to 40 age group, the Gunners have responded with some hard work and clear thinking. In a seeming attempt to clear the decks, Axl Rose has gone public about his sexually abused childhood and subsequent bouts of therapy. 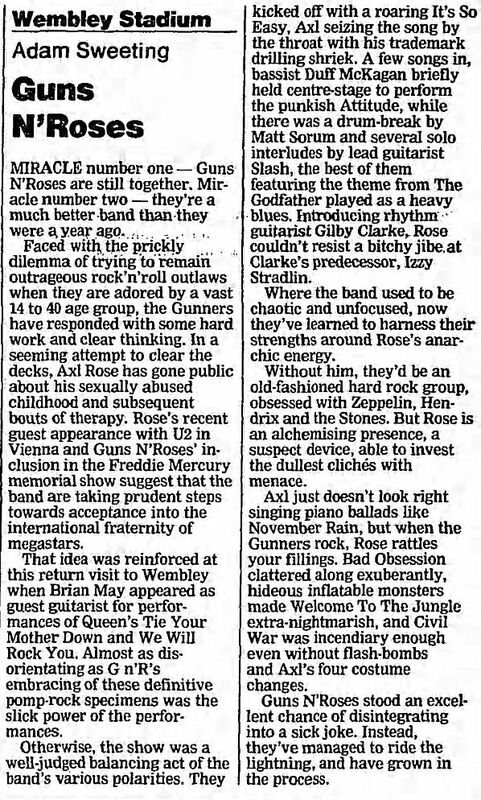 Rose’s recent guest appearance with U2 in Vienna and Guns N’ Roses’ inclusion in the Freddie Mercury memorial show suggest that the band are taking prudent steps towards acceptance into the international fraternity of megastars. That idea was reinforced at this return visit to Wembley when Brian May appeared as guest guitarist for performances of Queen’s Tie Your Mother Down and We Will Rock You. Almost as disorientating as G n’ R’s embracing of these definitive pomp-rock specimens was the slick power of the performances. Otherwise, the show was a well-judged balancing act of the band’s various polarities. They kicked off with a roaring It’s So Easy, Axl seizing the song by the throat with his trademark drilling shriek. A few songs in, bassist Duff McKagan briefly held centre-stage to perform the punkish Attitude, while there was a drum-break by Matt Sorum and several solo interludes by lead guitarist Slash, the best of them featuring the theme from The Godfather played as a heavy blues. Introducing rhythm guitarist Gilby Clarke, Rose couldn’t resist a bitchy jibe at Clarke’s predecessor, Izzy Stradlin. Where the band used to be chaotic and unfocused, now they’ve learned to harness their strengths around Rose’s anarchic energy. Without him, they’d be an old-fashioned hard rock group, obsessed with Zeppelin, Hendrix and the Stones. But Rose is an alchemising presence, a suspect device, able to invest the dullest clichés with menace. Axl just doesn’t look right singing piano ballads like November Rain, but when the Gunners rock, Rose rattles your fillings. Bad Obsession clattered along exuberantly, hideous inflatable monsters made Welcome To The Jungle extra-nightmarish, and Civil War was incendiary enough even without flash-bombs and Axl’s four costume changes. Guns N’ Roses stood an excellent chance of disintegrating into a sick joke. Instead, they’ve managed to ride the lightning, and have grown in the process.